Clinton, Anita Watkins. "Stephen Arnold Douglas - His Mississippi Experience," Journal of Mississippi History 1988 50(2): 56-88. Lincoln, Abraham and Douglas, Stephen A. The Lincoln-Douglas Debates: The First Complete, Unexpurgated Text. Harold Holzer, Ed. Harpercollins, 1993. Chisholm, Hugh (编). Douglas, Stephen Arnold. 大英百科全書 第十一版. 劍橋大學出版社. 1911年. Clinton, Anita Watkins. "Stephen Arnold Douglas - His Mississippi Experience" Journal of Mississippi History 1988 50(2): 56-88. Hansen, Stephen and Nygard, Paul. "Stephen A. Douglas, the Know-nothings, and the Democratic Party in Illinois, 1854-1858" Illinois Historical Journal 1994 87(2): 109-130. Huston, James L. "Stephen A. Douglas and the Dilemmas of Democratic Equality." Rowman & Littlefield Publishers, Inc., 2007. Johannsen, Robert W. The Frontier, the Union, and Stephen A. Douglas U. of Illinois Press, 1989. McPherson, James M. Battle Cry of Freedom. Oxford Univ. Press, 1988. Standard modern history of the war. Morris, Roy, Jr., The Long Pursuit: Abraham Lincoln's Thirty-Year Struggle with Stephen Douglas for the Heart and Soul of America, HarperCollins Publishers, 2008. Nevins, Allan. Ordeal of the Union especially vol 1-4 (1947–63): Fruits of Manifest Destiny, 1847-1852; A House Dividing, 1852-1857; Douglas, Buchanan, and Party Chaos, 1857-1859; Prologue to Civil War, 1859-1861. Quitt, Martin H. "Stephen A. Douglas and Antebellum Democracy." (2012) New York: Cambridge University Press. Douglas, Stephen Arnold. New International Encyclopedia. 1905. 1. The Democratic Party split in 1860, producing two presidential nominees. 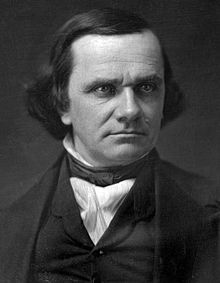 Douglas was nominated by Northern Democrats; John C. Breckinridge was nominated by Southern Democrats.